Ultra-modern, luxury villa with minimalist design and contemporary facilities, all less than 2km away from the glistening Balearic Sea!The sleek interiors are immediately welcoming. Ultra-modern, luxury villa with minimalist design and contemporary facilities, all less than 2km away from the glistening Balearic Sea! The sleek interiors are immediately welcoming, warmly lit by the dazzling sunshine which streams in from every angle. With substantial floor-to-ceiling windows, you can enjoy the sublime views throughout the villa and the expansive living areas, which include a vast sofa area in front of the satellite TV, and a bright and airy dining area. To one side of this, there is the modern kitchen with marble surfaces and sleek monochrome design, perfectly complemented by the colourful and traditional ceramics. Air conditioning throughout will keep you cool as a cucumber, even on the warmest of Balearic days! There are four modern and stylish bedrooms, all of which have direct access to the fabulous terrace, from which you can admire the breath-taking views. There are a flat-screen TV and fridge in all four bedrooms, as well as utterly sophisticated ensuite facilities. All four bathrooms are in-keeping with the minimalist and earthy tones, with beautiful modern facilities. On the terrace, you will find the 11x5 meter pool, surrounded by sun loungers where you can soak up some vitamin D in between dips in the refreshing water. There are also two Jacuzzis, one of which has a capacity for 12 people, where all the group can gather and admire the views! An outdoor dining area ensures you need never step out of the sizzling sun. 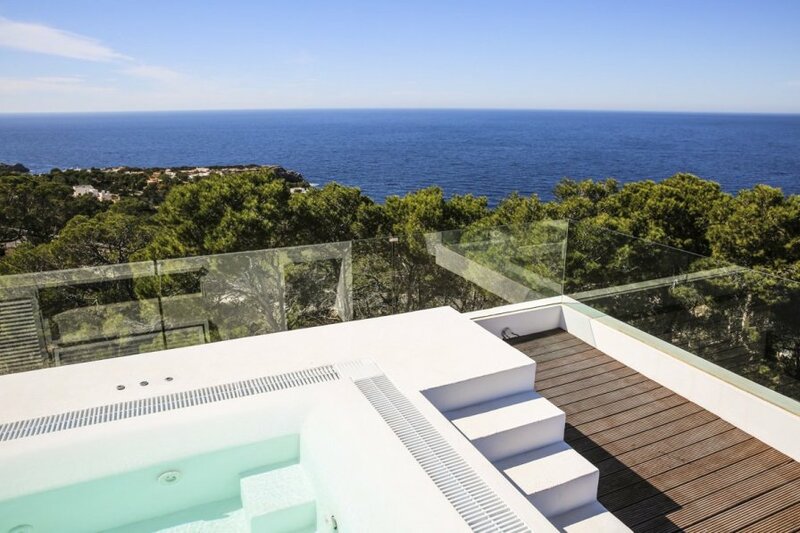 Nestled in a tranquil location, in the highest part of Cala Moli, Villa Moli offers unbeatable views of the sea, the islands S'Esparta and Bledas and the vibrant sunset each evening; this is genuinely the ideal home for a group looking to relax in the famous Ibiza sun in a private environment. The quaint town of San Jose is only 7km away, while the glitz and glam of Ibiza Town are 20km away. Just a short walk from the beautiful coastline of Western Ibiza and the sublime Balearic Sea, Villa Moli is ideally placed to enjoy all the real highlights of an Ibizan holiday! From water sports to a simple beach day out, the coastline offers so much to enjoy throughout the day, not to mention the world-famous club nights hosted in the beach bars, your most local of which, the fabulous Cotton Beach Club, is just ten minutes away! Of course, no Spanish island would be complete without a beautiful array of wine and seafood on offer, and Ibiza is no different, with a thriving culinary scene.